Summer is the traditional season for road trips. It’s the time to pack up and head to the beach, or the mountains, or perhaps even overseas (where you can rent a car and continue your trip). Of course, it’s also the hottest time of the year. It means you don’t have to worry about driving on snow or ice, which is helpful. But it can also make for some uncomfortable hours behind the wheel if you head out with an air conditioner that isn’t up to the task. You can drive along the ancient Silk Road in western China, as long as you don’t mind the harsh conditions. 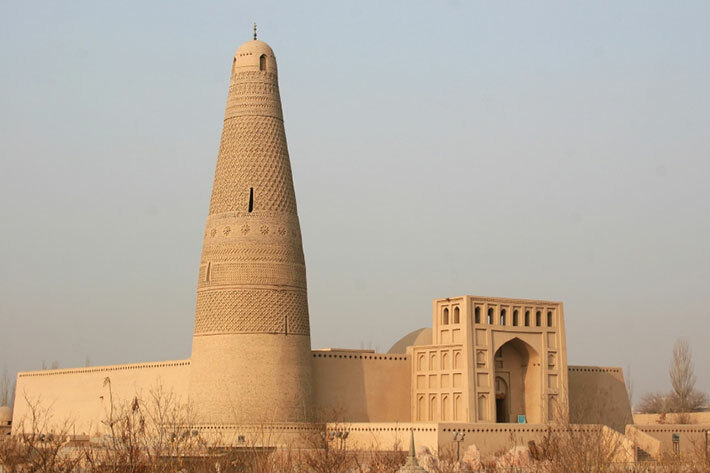 The city of Turpan (or Turfan) can get as hot as 119 degrees in the summer, and as cold as -20 degrees in the winter. 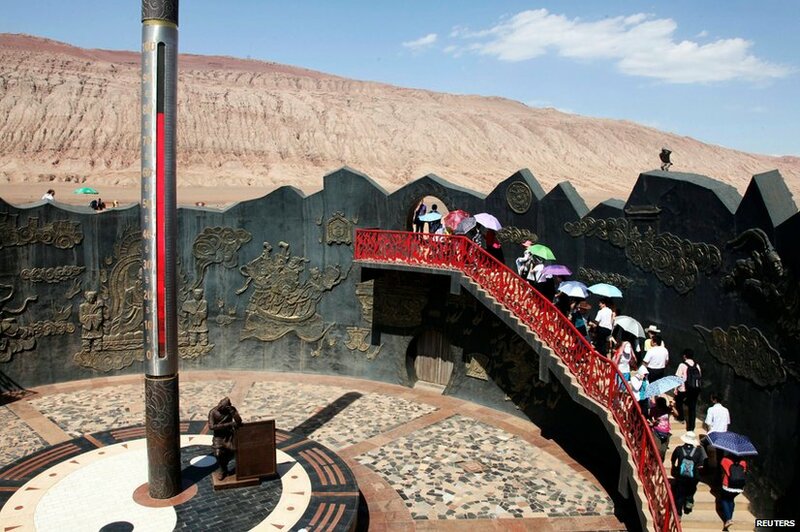 But it’s even worse outside of town at the Flaming Mountains (that’s their actual name), where a 40-foot-tall thermometer stands to remind tourists that it can get as hot as 78 degrees Celsius—which is 172 degrees Fahrenheit. Apparently that thermometer isn’t accurate enough for official records, but just the psychological effect is enough to make you melt into a puddle of sweat. Continue west along the road and you can drive across the Taklamakan Desert, one of the most inhospitable places on Earth. Nicknamed “the Sea of Death,” It is the largest shifting-sand desert in the world, and the place farthest from any ocean. 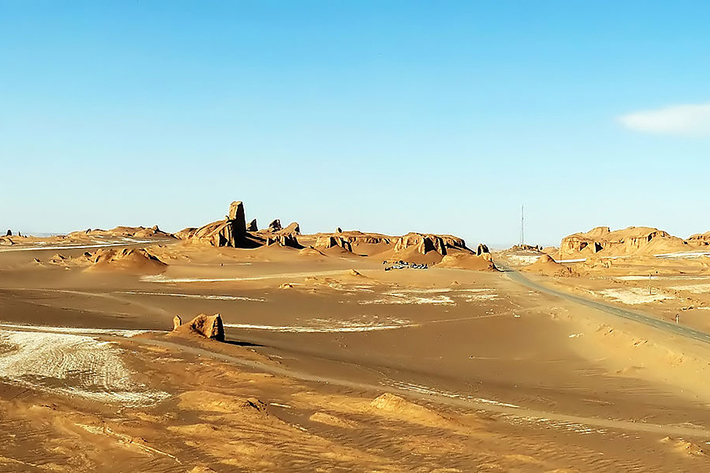 Some desert places, like Turpan, are extremely hot during the summer but quite cold during the winter. Other places are just hot year-round. 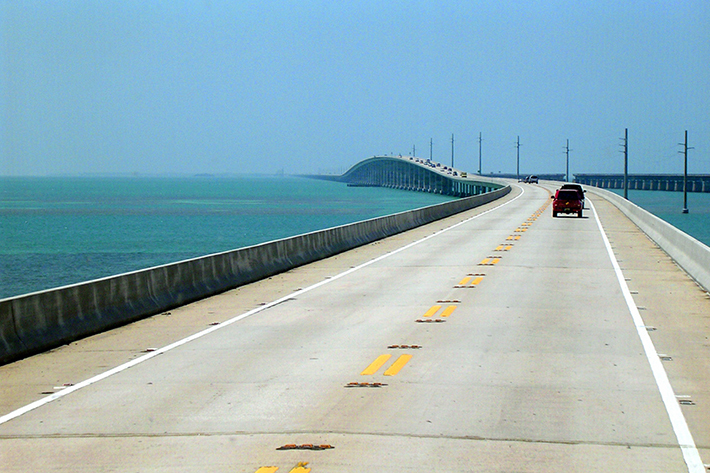 U.S. Route 1 in Florida travels to several popular road trip destinations, including Fort Lauderdale, Miami, and the Florida Keys. Though the area may rarely get up to triple digits, it also rarely gets cool enough to turn off the A/C. So when you look at average temperatures—both highs and lows, day and night, winter and summer—Route 1 in Florida arguably ranks as the hottest road in the country. 11 of the 16 hottest average temperatures in the U.S. lie along the road, mostly in the Keys. And since the road runs right alongside or even over the ocean, it’s not exactly a dry heat. The Australian outback is known for being two things: hot and remote. Nowhere is this truer than in Birdsville, a thriving metropolis of 295 people that is located over 300 miles from the nearest town. It averages over 95 degrees (Fahrenheit) for six full months out of the year, and summer highs are routinely over 110 degrees. During one 2013 heat wave, when temperatures reached 119, residents couldn’t cross the road without their shoes melting. 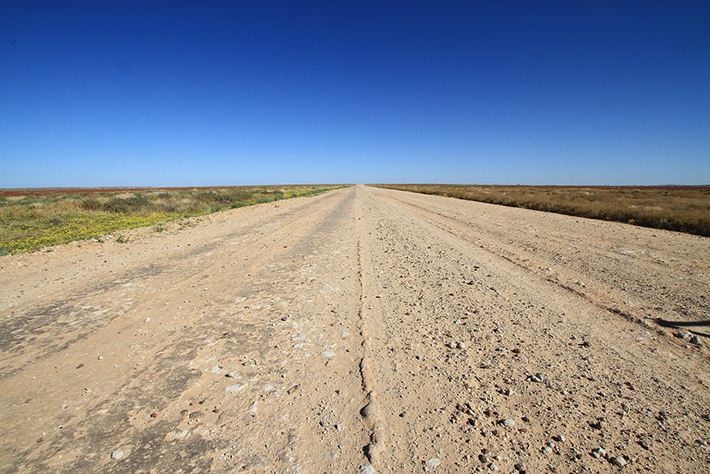 That road is the Birdsville Track, a mostly unpaved 321-mile road that crosses two deserts on its way to town. Besides having a cold A/C, it’s wise to stock up on gas and water: there’s only one place to stop along the entire route. As in Florida, Hawai’i is less about record high temperatures and more about sustained average heat. But that’s not why we chose these connected national park roads for our list. It’s because they drive right next to an erupting volcano. Kilauea has been erupting continuously since January 3, 1983. In that time it has poured out over 120 billion cubic feet of lava, covering 48 square miles of land. Following the roads and the instructions of the Hawai’i Volcanoes National Park staff should keep you at a safe distance from the 2,000-degree lava, but lava has flowed onto the road several times. 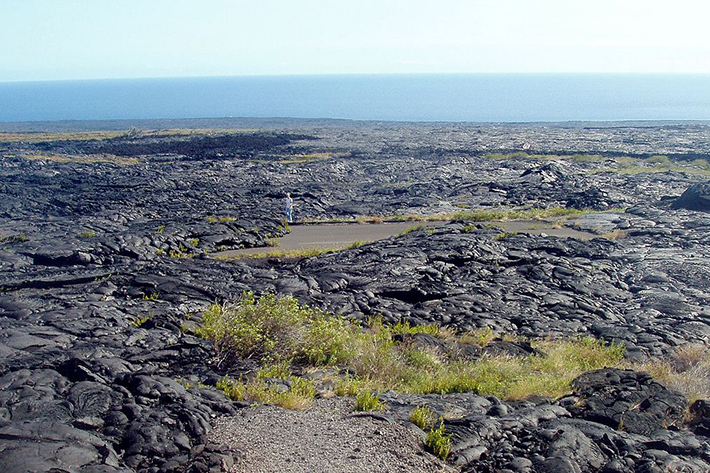 In fact, the Chain of Craters Road is currently a dead-end because the last 7.5 miles (and most of the town of Kalapana) have been buried by lava flows. One of the problems with comparing heat records is that there are several different ways to measure temperature, and many of the hottest places are so remote that they don’t have weather stations. The Lut Desert reached a high of 159 degrees, the hottest surface temperature recorded. The satellite couldn’t measure the air temperature above the surface, but you can be sure it’s plenty hot: even bacteria don’t survive in the Lut Desert heat, and unrefrigerated milk doesn’t spoil there because it’s too close to boiling. Saudi Arabia’s Highway 40 is the most important road in the country, running from coast to coast across the Arabian Desert. 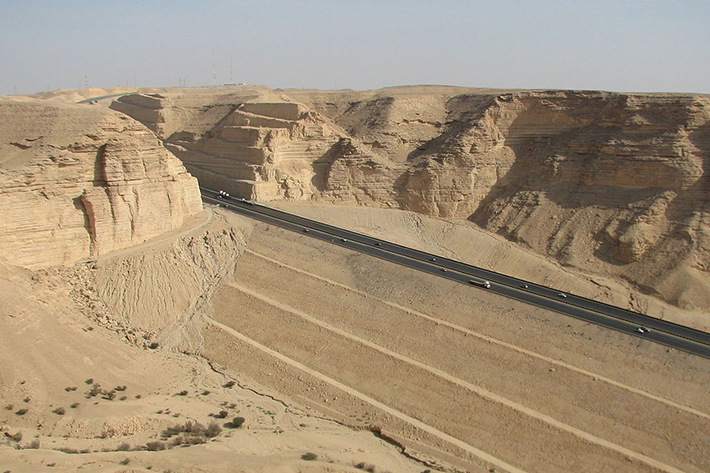 It passes through the country’s capital, Riyadh, and provides a literal road to Mecca. It’s also six lanes of scalding hot blacktop. The average summer high temperature along the road is about 110 degrees, and even at night it stays above 85 degrees. What’s most impressive is that it stays that hot for basically the entire 844-mile, 12-hour drive: it averages 109 degrees in western Mecca during July, 110 degrees in central Riyadh, and 113 degrees in Dammam at the eastern end. Besides keeping cool, you also have to watch out for the occasional sandstorm due to high winds blowing across the Arabian Desert dunes. The hottest officially recognized temperature ever recorded on Earth is in Death Valley, California. 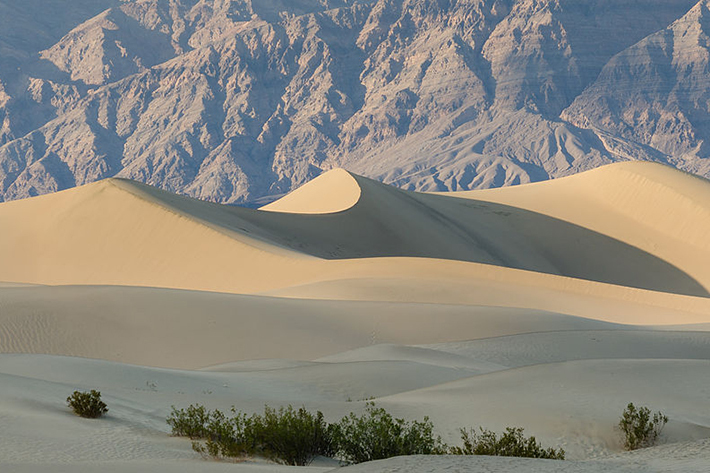 The average July high temperature in Death Valley is 116 degrees, with the average low being a still-sweaty 88. The all-time high (for the planet) was 134 degrees, on July 10, 1913. But that’s not the only time it’s gotten extremely hot; on the list of the highest all-time temperatures for the entire United States, Death Valley holds all of the top 8 spots. Despite its name and the heat, Death Valley National Park still attracts hundreds of thousands of visitors each year, who cross the valley on the 130-mile-long State Route 190. Park officials kindly request that you don’t fry any eggs on the pavement, since too many visitors had begun doing exactly that. If you want to experience that kind of heat without the long road trip, you could always just get into a car with no air conditioning on a sunny day. If, on the other hand, you’re not insane, you can stay safe and comfortable on the road (wherever you are) with cold air courtesy of A/C Pro. All it takes to get your cold air back is a can and about 10 minutes, with no experience or tools required. Good luck, and stay cool on your summer road trips, wherever they may take you!